This is the first Finnish paperback edition of Coyote Waits, and was published by Otava in Helsinki, Finland in 1991. It is a part of the Crime Club which is the division of Otava that printed crime novels from 1989 till 2008. 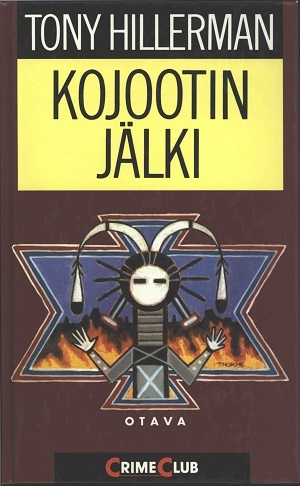 Tony Hillerman's original text was translated from English to Finnish by Jyrik Raivio. The cover art is uncredited but it adapts the Yeii figure from Peter Thorpe's original cover. Format: Hardback, 21.4 x 13.4 cm. Binding: Full-color boards with the CC, the author, and the title printed vertically on the spine.